kidslooklikekats: Sam Prekop: "Old Punch Card". Apparently, shortly before, during and after the writing/recording of not one, but two albums for release under Chicago's post-rock staple The Sea and Cake, Sam Prekop (vocalist/guitarist for The Sea and Cake and visionary leading an astoundingly original solo career) began recording every synthesized tinkle, bloop and blip that tickled his fancy. Armed sparingly with synthesizer and studio headphones - not at all standard fair for Prekop, but an obvious passion since The Fawn - Sam translates a rawer, more intricate side of his artistic inner man to musical form; one we've undoubtedly only seen the emergence of. Recorded over the last three years as a side project to all of Prekop's many other side projects, including a successful career as a painter and photographer, Old Punch Card is an experiment combining improvised synth textures and subtle melodies crafted from raw sound sketches. Though slated for release on September 7th, my inbox was recently teased with a track from the upcoming album entitled "The Silhouettes". I was instantly taken back to the Japanese import of The Sea and Cake's 1997 masterpiece The Fawn, and most notably its last five tracks which were bubbly, electronic sound experiments that intrigued me for their natural beauty and their experimental nature, and gave way still to TSAC's sonic signature and opened a whole new avenue of their incredibly unique sound. In short, Old Punch Card could very well be Sam's "New Card Swipe" on his previous musical output. That's a very good thing. 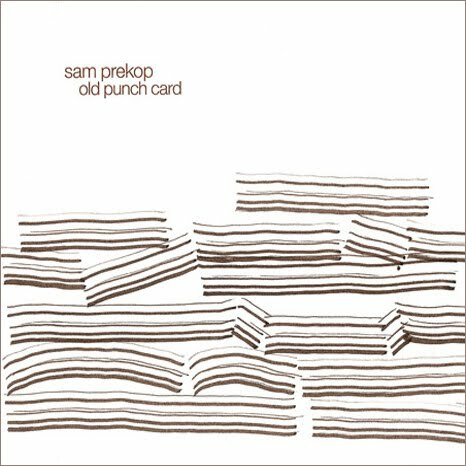 Sam Prekop - "The Silhouettes"
From the upcoming album Old Punch Card.